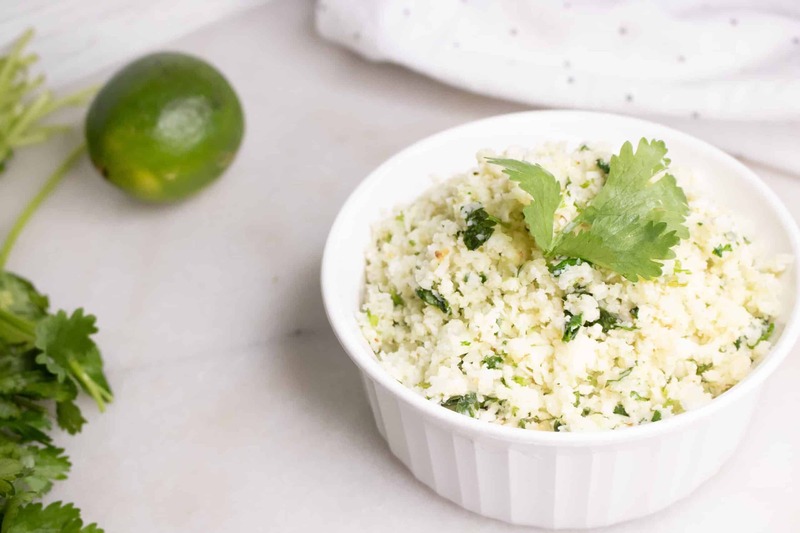 Cilantro Lime Cauliflower Rice is a super easy and super delicious healthy recipe. Perfect for those of us that resolved to get healthy and eat better this year. For me, finding fun, different and easy recipes that are also healthy and filling is crucial for sticking with it and staying motivated. And that is exactly why I am so excited about this recipe for Cilantro Lime Cauliflower Rice. It checks all of those boxes and more. Riced cauliflower is all the rage these days, and many companies have acknowledged its popularity and are now doing the ricing for us. I love that riced cauliflower is readily available already packaged and ready to use. Keeping healthy ‘convenience foods’ like this on hand is such a great way to quickly and easily whip up delicious and good-for-you meals. 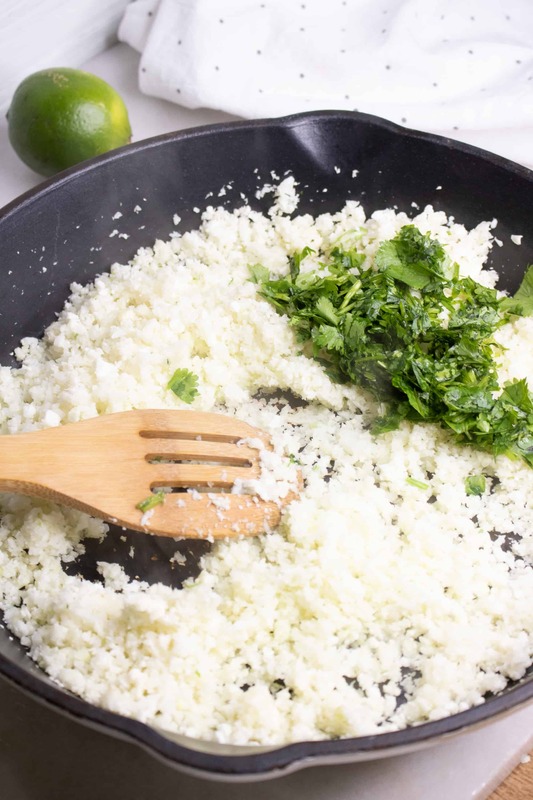 So What’s So Great About Cilantro Lime Cauliflower Rice? 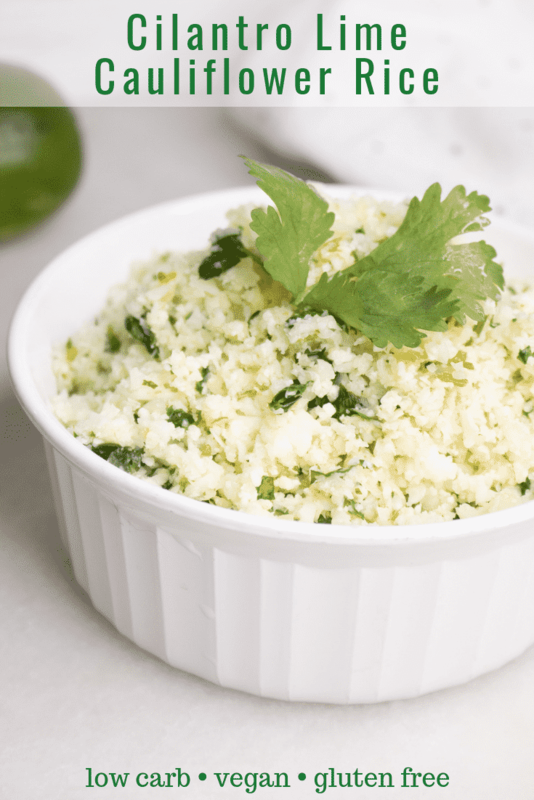 Making Cilantro Lime Cauliflower Rice is unbelievably quick and easy!!! And as mentioned above, you can find frozen riced cauliflower in most grocery stores these days, so all you have to do is measure it out. Then chop the cilantro, juice a lime, heat up the oil in a pan and throw it all together. In just minutes you have a healthy, super tasty side dish. It is so versatile. Serve it as a side dish. Or, looking for a quick, healthy and filling dinner? Then add some baked or grilled chicken to the mix! 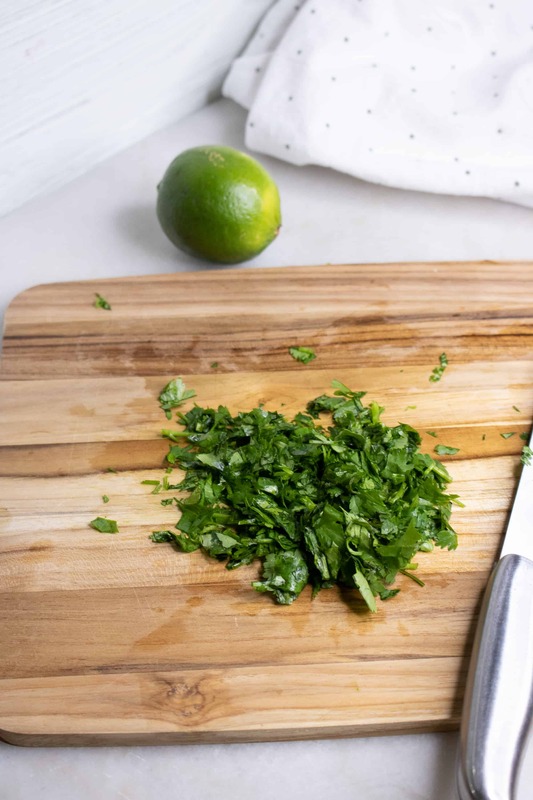 The lime and cilantro bring a bright and fresh flavor that will pair nicely with chicken. Cauliflower is super healthy for you. One cup of cauliflower provides 3 grams of fiber which is 10% of the recommended daily amount. We all know that fiber is important, but sometimes it’s hard to get it all in. 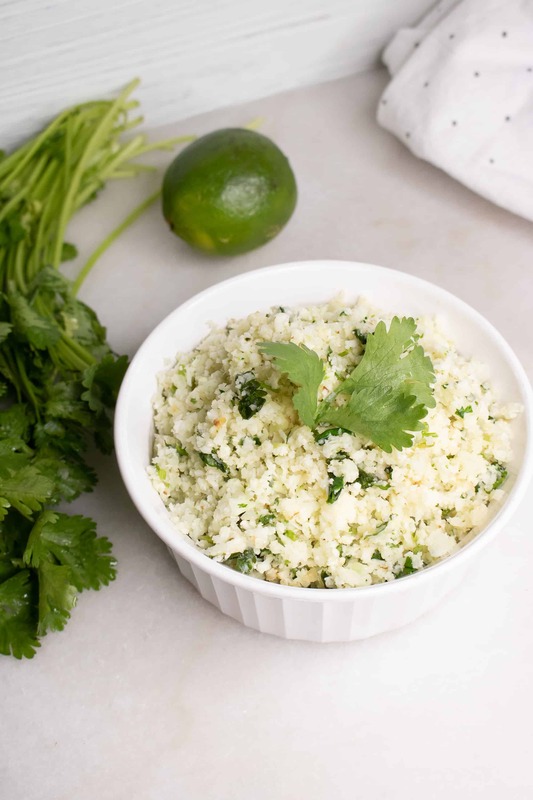 This Cilantro Lime Cauliflower Rice recipe helps you along the way while also providing several essential vitamins and minerals (Vitamins C, K, B6; as well as manganese, folate, and potassium). And not only is it good for you, it tastes great too. Heat oil in a large skillet or wok over medium heat. Add in cauliflower rice and chopped cilantro and then sauté for 4-5 minutes. Next add in the lime juice, stirring to incorporate and cook for an additional 3-4 minutes. Then just serve it up and enjoy! This Weight Watchers Low Fat Meatball recipe would be the perfect main dish alongside your Cilantro Lime Cauliflower Rice! The other beautiful thing about fried cauliflower is that it can serve as a substitute for “real” rice. Try it as a base for this awesome Shrimp Creole Recipe in place of the rice. Cilantro is known as an often used herb in many Mexican dishes. 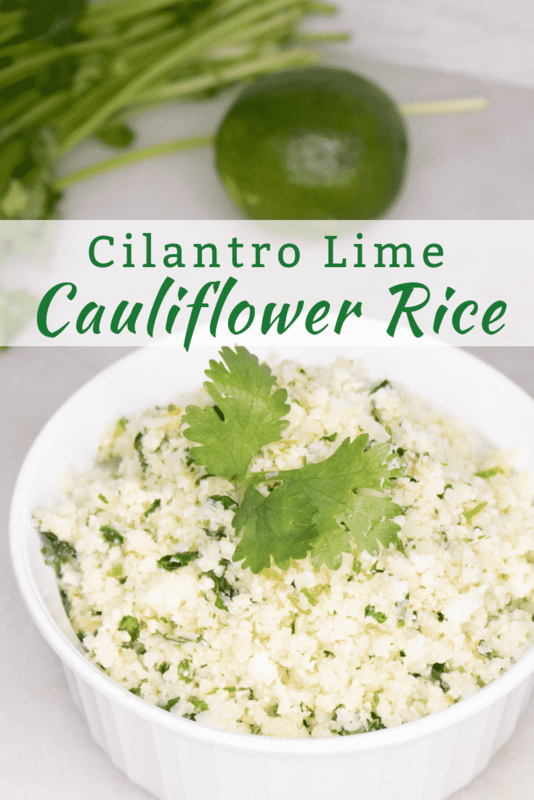 How perfect would the Cilantro Lime Cauliflower Rice taste as a side dish to this healthy Mexican Slow Cooker Shredded Chicken? Yum! Add in cauliflower rice and chopped cilantro and sauté for 4-5 minutes. Next, add in the lime juice, stirring to incorporate. Cook for an additional 3-4 minutes.